I began painting in 2000, and experimented with watercolor, collage and eventually printing. I love all three media. However, when I started printing in 2003, I was hooked! With printing I never know how my concepts will materialize. Photography is another hobby of mine, and I am particularly drawn to landscapes. What I see in nature moves me, and I always have my camera with me to capture scenes that are unusual to my eye. The myriad of colors in nature are spectacular, and I try to reproduce what I have recorded. Whether it is blue mountains rising in the distance or a fantastic sunset as I walk out of a building, I am excited with the scene. I wish to compose an etching, monotype, or lithographic photo transfer to capture my impression. Although labor intensive, I love the process and the outcome. Intaglio etching requires transferring a drawing onto a copper plate. Deciding the colors to illustrate the drawing determines the number of plates needed. The plate(s) are immersed in ferric chloride for various lengths of time, depending on the value required. The longer the time, the darker the value. Each plate is inked separately and then wiped so only the etched part retains the ink. To print, register the paper so each plate will be matched perfectly as it is pulled through the press. When all the plates have been run though the press, the print is complete. Each etching is signed and numbered with the impression number over the number of prints in the edition (example: 3/10). 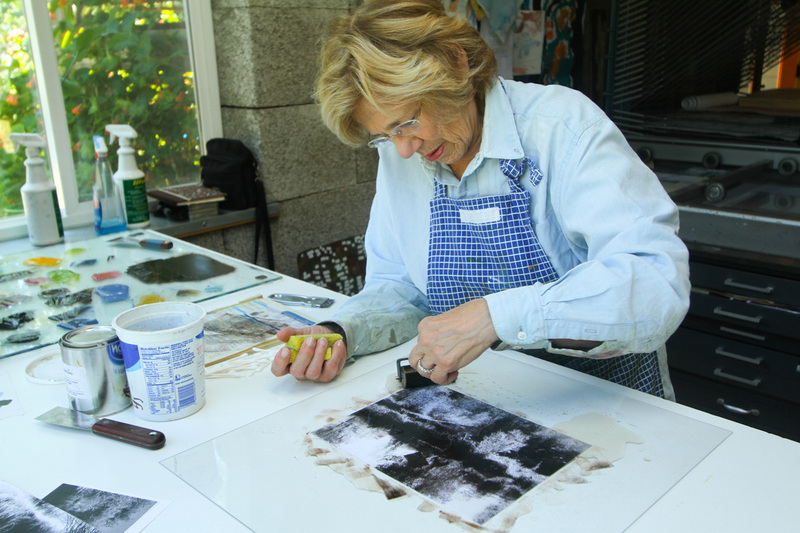 The paper is soaked for etchings while left dry for monotypes. Monotypes are one of a kind. The impression number is always 1/1. The picture is drawn on Plexiglas. Then paper is attached to the Plexiglas on the other side of the drawing. Akua ink is then applied to the Plexiglas using various colors to create the effect desired. The paper is then placed face down on the Plexiglas, and pulled through the press. The picture can be run through the press several times before the final print is finished. Lithographic photo transfers use photocopied images which are wet with a solution of water and gum arabic and then inked with a roller charged with oil-based ink. Once the image is fully inked it is taken to the press bed, paper is placed over the image, then plexiglass over the paper and run through the press. This transfers the image onto the paper. This can be the finished artwork or other layers of color may be added using the monotype technique. All images on this website are copyrighted by the artist. Use of these images without permission is strictly prohibited.